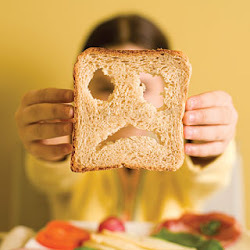 For my meal... 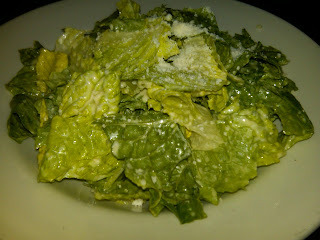 I started with the caesar salad, they were very accommodating and held the croutons for me. They confirmed the caesar dressing was GF, and it was great. I asked for crushed pepper and extra dressing - the pepper was thick and had me chocking for a second, but, it was still a great salad. The kitchen is exposed, and the shelf separating the kitchen from the dinning room is decorated with pasta boxes. Included in the mix is the GF pasta offered. 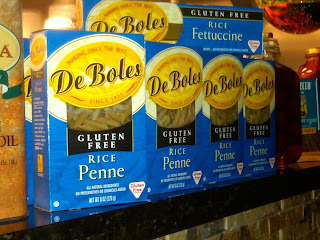 I've never seen De Boles before, but, was so happy Cafe Europa knew of them! 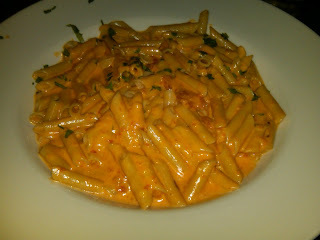 I had the vodka sauce - I've heard many differing opinions on vodka and whether or not they are GF. Some say all triple distilled or more are absolutely GF, some say if its grain based it'll never be GF - if anyone has more on this - I'm all ears. In this instance, this was by far the best tasting sauce I've ever had in my life, but, I had immediate heart burn. I was devastated. It was SO delicious, I literally wanted to dive in my plate and live in the pasta sauce, but, I had to stop eating and run to Walgreen's for Zantac. Would I absolutely go back and try a different sauce that isn't tomato/vodka based, YES! The pasta was AMAZING and they absolutely know what they're doing in the kitchen. 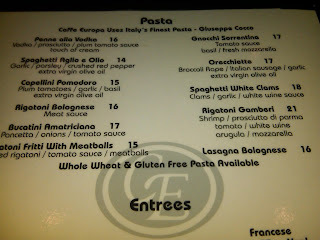 I'm excited that Cafe Europa offers a GF pasta - and shows everyone the box to boot! It's a great Italian dinner - just be careful with the sauce you choose to accompany the delicious pasta. I recently went back to Cafe Europa, and again, was pleasantly surprised. I tried the pasta pretty plain this time, just had garlic and olive oil - still delicious - but, in the spirit of full disclosure, nothing compares to the vodka sauce! !